What's New In Church Leadership? Local church life is changing dramatically. Once familiar and established patterns of leadership are giving way to new and emerging forms of ordained and lay ministries; clergy now often work in teams with resposibility for large groups of churches, and many congregations are exploring entirely new ways of serving their local communties through initiatives like Fresh Expressions. Membership of traditional denominations may be falling, secular culture may be hostile to the church, yet there is genuine spiritual hunger that cries out for satisfaction. Challenges and opportunities on such a scale require fresh and innovative thinking about what new styles of leadership are needed in the vastly changed landscape in which churches now find themselves. Growing through change - and resistance to change! What's New In Church Leadership? by Malcolm Grundy was published by Canterbury Press in May 2007 and is our 34676th best seller. The ISBN for What's New In Church Leadership? is 9781853117992. 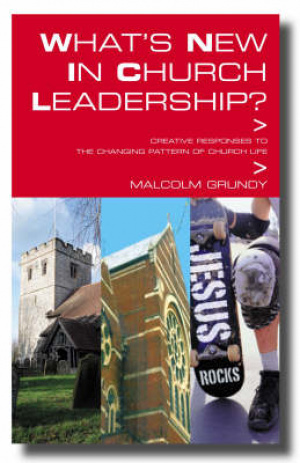 Reviews of What's New In Church Leadership? Everybody in the Church, of whatever denomination seems to be thinking about “Leadership”. The author has himself been appointed to the relatively newly formed Foundation for Church leadership, and this book is very much about how existing leaders can improve their skill sets and how new leaders can realise what is means to be a leader in the modern church. This book should be essential reading for all prospective clergy – to allow them to realise what lies ahead and the pitfalls they are likely to face. The book brings up to date all the thinking we may have had on leadership and introduces some interesting and new facets of existing skills. We remember that we are part of a team and that sort of leadership needs different skills – gone are the days when “Father was right”. A book you don’t really want your congregations to get hold of, for then they will realise what you should be doing! Everybody in the Church, of whatever denomination seems to be thinking about �Leadership�. The author has himself been appointed to the relatively newly formed Foundation for Church leadership, and this book is very much about how existing leaders can improve their skill sets and how new leaders can realise what is means to be a leader in the modern church. This book should be essential reading for all prospective clergy � to allow them to realise what lies ahead and the pitfalls they are likely to face. The book brings up to date all the thinking we may have had on leadership and introduces some interesting and new facets of existing skills. We remember that we are part of a team and that sort of leadership needs different skills � gone are the days when �Father was right�. A book you don�t really want your congregations to get hold of, for then they will realise what you should be doing! Got a question? No problem! Just click here to ask us about What's New In Church Leadership?. Details for What's New In Church Leadership?